My ego is very well aware that failure/mistakes are supposed to be a good thing. It’s a sign of action, of trying, of effort and no true success can ever be accomplished without some level of experiencing failure. Thomas Edison failed close to 10,000 times before he invented the light bulb. But the key was that in his mind he really created 10,000 ways in which the light bulb did not work. So why is it, despite all my years of self-exploration, do I still fear failure? And yet somehow, time and time again, I have not only survived failure, but many of my best learning experiences have been in the moments when failure looked me right in the eyes, while at the same time kicked me in the a**. Here is one of my many stories of failure. I have mentioned a few times in blogs now that I have skydived before. What I haven’t mentioned yet is that my nickname from the sport is “Wally”. Why Wally??? Because Crash, Dent, KO, etc were already taken. 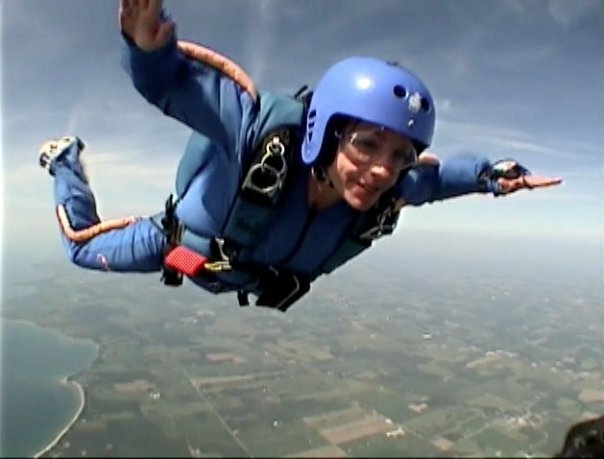 Skydiving has not only given me many amazing opportunities and glimpse into such states as freedom, awe, bliss, and the feeling of being fully alive as fear rages through my body. It has also given me the experience of failure. Failing in skydiving is not something typically you would want to call to your life…and let me tell you as I explained to the triage nurse that my injuries were due to a skydiving accident (resulting in an OR room being booked, as I was then fast tracked into emerge, despite my constant protest that I was certain at most I had a small crack in my ankle bone) I was well aware of how serious failure in this sport really was. So here is my story… it was my second solo dive (my fifth skydive). I had a one-way radio on so I could hear my coach, but he could not hear me. As I was coming in to prepare for landing, the instructions I received seemed odd. They seemed to be in direct contrast to the instructions I had received earlier when we did our dirt dive (practice dive while on the ground). But I did what I often do, ignored all the red flags my intuition, gut, and body were sending up and trusted my coach. What I did not know at the time was that from the angle I was on, the depth perception for my coach was incorrect. He did not realize I was as low as I was, nor that I was as far back as I was. Either way…I knew not to cross the road and get myself over the hydro lines, but I did. As a result, I was now flying in low over the parking lot and headed straight towards a building. You guessed it, despite the very larger grass landing area just a few feet away, I managed to hit the building. Now I had been well trained and knew exactly how to “hit” something (incase of such event), so was well prepared. I flared at the exact moment I needed too. In order to avoid the railing I lifted my legs at the exact moment I needed too, then very gently hit the building. It felt surreal as I slowly slid down the side of the building (yes almost like a cartoon character) and sat on my bottom. One of the other skydivers happened to be walking by in that moment so I turned and asked him if he didn’t mind could he please help me to my feet, as I was feeling a little shaky. He offered his hand, then changed his mind and suggested maybe I sit for a moment consider what had just happened. I failed big time on that jump!!!! Failed to listen to my own “knowing”, failed to find a safe place to land, failed to follow the rule of not crossing over the hydro lines and on and on…but in that failing I learned sooooo much. Following Thomas Edison’s line of thinking, I learned how to hit a building and survive! And I got back at it (not until the next season as I was on crutches for a couple of months while my ankle healed). But let me tell you, when I jumped again, the experience was all the more sweeter. I learned that my desires are stronger than my fear of failure! It was a beautiful lesson, and one that I am holding close to my heart as I am currently exploring what my life purpose might be. I am exploring what my desires and passion are and at times I hear the voice of my ego saying “oh you can’t try that; you are going to fail, don’t even think of that, who are you to think you can do that, can you really live with that failure?” My answer is YES, I sure can!!!!! Because to not try is the real failure! A good friend reminded me “Life isn’t too short. Life is precious. Every minute counts!” With each new blog I write, I realize how much more there is to explore within me; I hunger for it, I crave it, and when I lose this focus I find my self-awareness calling me back. With each step, with each new area explored, with each new insight, I feel more and more raw. And with that rawness comes a richer, deeper, understanding of my relationship with freedom, vulnerability, patience and the unknown. Failure is an option, but worth the risk. And my soul says “Ahhhh, welcome home! You are remembering all that you have forgotten, but that which you have always known”.